A sample of what the decal might look like, front and back. Florida's vessel inspection law go into effect starting July 1, 2016. Previously referred to as the "Probable Cause" law, House Bill CS 703 was approved by the Governor March 25, and prohibits local and state law enforcement from "stopping a vessel for the sole purpose of inspecting it for compliance with the safety equipment carriage and use requirements" if it displays a Florida safety inspection decal issued by law enforcement on a previous stop. Congratulations for having a properly equipped vessel on the date and time of inspection! Please continue to check the condition and quantity of your safety equipment frequently. In order for this decal to be valid, it must be placed on the forward half of the port side of the vessel above the waterline. If displayed on a registered vessel, it must be within 6 inches of the vessel's registration decal. 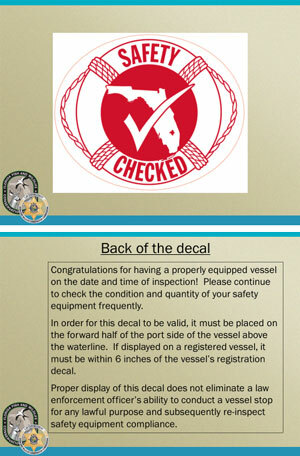 Proper display of this decal does not eliminate a law enforcement officer's ability to conduct a vessel stop for any lawful purpose and subsequently re-inspect safety equipment compliance. "Only this decal, issued by a law enforcement officer, will be valid to trigger the changes found in 327.70 Florida Statutes," according to Capt. Klein. For example, safety inspection stickers issued by the Coast Guard or Coast Guard Auxiliary would not trigger the "reasonable suspicion" requirement. The language being used is “reasonable suspicion” rather than “probable cause.” Vessels are stopped for many other reasons other than checking safety gear – for example, marine sanitation compliance and fisheries enforcement to name two. The law also changes the careless operation section of the statute (327.33(2)): Riding on the bow of a boat will now be legal according to Florida state law unless it rises to a reckless level; however, federal law still prohibits bow-riding and subjects a person to a $500 fine, according to Capt. Klein. The "reasonable suspicion" requirement also applies only to local and state law enforcement and not to Coast Guard or other federal law enforcement officials.